Over/Under: Over 150.0 at 1.90 Bet Now! Both of these teams lost out in Round 3 of the Euroleague and both of the teams come into this clash with a 1-2 record. One team will rectify this but for the loser, a 1-3 record after 4 games is going to be very disappointing. This century, the Catalan club have the upper hand against the Germans, holding a 5-1 record. It is fair to say that a 1-2 record is bad news for the hosts; they have suffered a lot of injuries which haven’t helped their cause. Any team that loses their two leading scorers would struggle and this is what is happening to Barcelona at the moment. Justin Doellman has averaged 14 points per game and Juan Carlos Navarro has averaged 13 points per game this season but both of these players were absent for the recent Barcelona game and they’ll be absent in this game too. This is one area where the fast paced nature of the double-header game hasn’t helped a team. 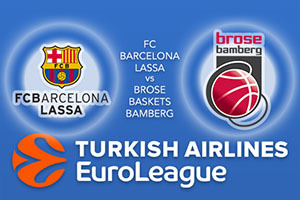 While Brose Bamberg have struggled against Barcelona this century, they did win last season. That was in Germany, so the away side knows how to get beyond their Catalan rivals. They may want to put the 75-57 reversal in Barcelona out of their mind but there is no getting away from the fact that the Germans can win against this opposition. Darius Miller has been in decent form, averaging 14.7 points per game while Janis Sterlnieks has picked up an average of 13.3 points per game, as has Nikos Zisis. If these players can push the game forward, it could be a sticky night for the hosts. Barcelona do have their injury problems to deal with but the Catalans will still fancy themselves to win at home. This is why you should look to take FC Barcelona Lassa at -5.5, which is on offer at odds of 1.90. With the Over/Under market for this game, you should look to go OVER 150.0 which you’ll find available at odds of 1.90. Bet Now!